Good communication and oral numeric skills develop out of playing and working together in an informal and practical atmosphere. Daily, the children take part in activities such as counting games, rhythmic activities, poetry, rhymes and singing, including material in French. The oral tradition is integrated into most parts of the day to encourage listening and speech development. Children experience the musicality of language and its social aspects through playing circle games and eurythmy, a form of movement, which works with language and music. Children are encouraged to speak freely and learn to listen to others. Use of language enables cognitive development and well-chosen words and good syntax support clear thinking. The development of a good memory and recall are reliant on the spoken word, rather than the printed word or computers, and speech develops concentration and empathy, which are essential for formal learning. 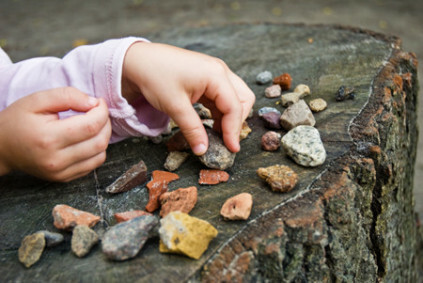 Our classrooms integrate mathematical concepts and the use of mathematical language on the grounds that grasping mathematical concepts such as weight, measure and shape is most meaningful when it relates to everyday activities and routines. For example, the preparation of food provides an opportunity to weigh, measure, count and use numbers, and setting the table is another area where math is used in a practical way. Through movement games, children recognize and recreate patterns – in, out, alternate, above and below, in front of, behind etc. 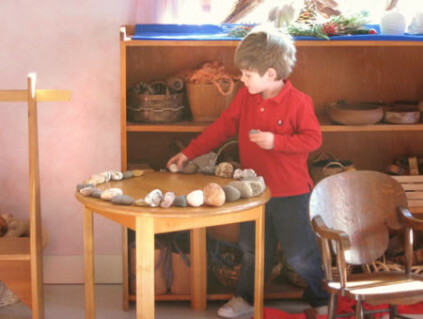 Natural objects such as acorns, pinecones, and shells are sorted, ordered and counted, as part of spontaneous play. This approach to the introduction of mathematics embeds the concepts in a social and moral context.